Inmates Gabrel Longtail, left, and Elijah Larock, center work on Pre GED Social Studies with instructor Michelle Candy at the Missouri River Correctioal Center on Thursday. 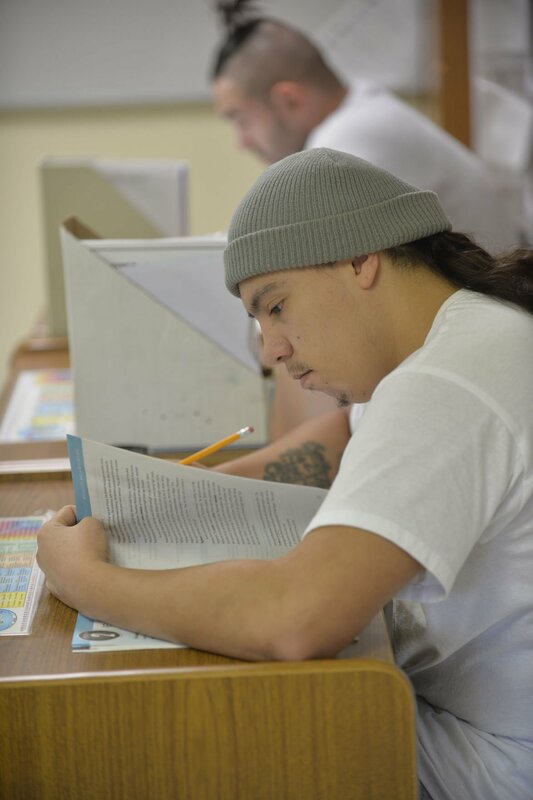 Inmate Nicholas Belgarde works in a pre GED Social Studies class at the Missouri River Correctional Center on Thursday. Inmates learning welding skills manufacture cattle gards and fencing at the Missouri River Correctional Center on Thursday. In a Bismarck classroom last month, students learned the Pythagorean theorem. They took notes and asked questions as their teacher explained how to calculate the hypotenuse of right triangle. It was fairly normal, except the students and teacher wore the same outfit -- jeans and a white T-shirt -- and none of them will be allowed to leave school property for several months or years. The classroom is inside the North Dakota State Penitentiary. The man teaching that day is serving a 30-year sentence. “He’s kind of been our fill-in for our math teacher temporarily,” said Rose Kreitinger, who oversees education at the penitentiary. Education is a point of pride for the North Dakota Department of Corrections and Rehabilitation, which last year was the national leader among all adult education centers, prisons or otherwise, for passing rate on the GED exam. It goes toward a refrain heard from employees at all levels of the DOCR: 97 percent of prisoners are getting out, what condition do you want them in when they do? Across North Dakota, cells are filling up. The DOCR is reaching capacity. As of Friday, there were 1,590 men incarcerated at state prisons, which has a maximum capacity of 1,624. “We know we’ll get there eventually,” DOCR director Leann Bertsch said of approaching population limits. Average daily population within DOCR rose by 21 percent between 2011 and 2016, and when a 300-bed wing was added on to the state penitentiary in 2013 it took less than a year to fill. There were 664 more people admitted to the prison system in 2016 than in 2011, according to state data. County jails across the state added 886 beds in 2017 through expansions and new facilities. A new state law allows the DOCR to put a 30-day freeze on accepting new inmates from district courts if capacity is reached. Those sentenced to prison, meaning their sentence calls for more than a year of incarceration, will be assigned a 1-10 priority ranking. A 1 ranking is reserved for those convicted of a Class AA felony, lower rankings are based on the level of offense, criminal history and other factors. The North Dakota Association of Counties has pushed back against this change, but Bertsch said the law also allows counties to make decisions on who they incarcerate. “It’s just easier to continue doing what they’ve been doing,” Bertsch said, adding counties need to start addressing the issue at a local level. Steven Morrison, a law professor at the University of North Dakota, said the state and local governments should consider treating drug possession cases as a public health matter instead of a criminal matter and warned against building bigger jails. “If we do, they’ll be filled,” Morrison said. He said spending money on health care infrastructure to make counseling and addiction treatment more available to people would result in lower crime rates. “It’s humane, cheaper and makes our society better,” Morrison said. In October 2015, Bertsch and other staffers took a trip to Norway to visit prisons via the U.S. -European Criminal Justice Innovation Program, which brings corrections leaders, judges and prosecutors to see how other countries enforce criminal justice. Scandinavia has a reputation for progressive attitudes for incarceration. “It was a huge opportunity,” Bertsch said. The trip to Norway was eye-opening in several ways, participants said, including a realization that long-term solitary confinement is largely inhumane and ineffective. “It hurts people,” said NDSP Warden Colby Braun. At the time of Bertsch’s visit to Norway, Braun said the penitentiary had 98 people in its segregated housing unit. Today it has 20 and is referred to as a behavior modification program, including two full-time counselors dedicated to segregated housing inmates. Braun said only 20 percent who get put into segregated housing re-enter it. He said the changes are positive and have given him a different perspective after 20 years in corrections. In September, the prison hosted a “Concert for Hope” performance by renowned composer Eric Genuis and had a barbecue for 15 prisoners and their families. They hosted a father-daughter dance for inmates earlier in the year. “We’re just trying to do normal stuff,” Braun said. Her international education continued this summer with a trip to Ireland, which she said inspired her to begin redesigning North Dakota’s correctional officer training. In Ireland and Norway, prison guards go through a two-year training program. She wants her guards to be personable to inmates, not exactly friends, but respectful and understanding. “We’ll never be Norway because we’ll never have the resources they have,” Bertsch said. “Prison is still prison,” she said. A goal for many inmates is to get a job with Rough Rider Industries, a private company staffed by prisoners. Inmates must have good behavior status and their GED diplomas before they’re eligible to apply for the job. They must submit a resume and go through an interview process. “We try to replicate what they’d do on the outside,” said Rough Rider director Rick Gardner. The prisoners start on a wage of 45 cents an hour and work their way up, the average wage is $1.67 per hour. Gardner said while the wages aren’t much, they help inmates pay off fines and the job training gives them real world skills. Rough Rider makes all the furniture used in government offices across the state, most of the dumpsters seen in North Dakota, all of the road signs and license plates. Last year they produced 2.4 million plates. At the minimum-security Missouri River Correctional Center, known as “The Farm,” Rough Rider workers can get a certified welding certificate via Bismarck State College. The Farm houses 155 inmates, most of whom are in the final six months of their sentence and have good behavior status. About 15 residents who are part of the work-release program are housed in a Bakken-style “man camp” with individual rooms with mini-fridges and TV. They can buy cable if they want. There are no walls or fences surrounding The Farm. Inmates have a large recreation area with worship spaces, basketball and handball courts, a weight room and library. “We’re pushing the boundaries,” said Farm Deputy Warden Joey Joyce. Joyce said the transition to the low-security prison was difficult at first, but he’s warmed to it. In the four years he’s worked there, only five inmates have ever walked away. They’ve taken inmates on field trips to the state Legislature to talk to lawmakers about drug policy and Fort Lincoln State Park. This year, Farm inmates cleaned the Dakota Zoo on United Way Day of Caring. It’s all part of integrating prisoners with the general population on their way back to society. “We want people to look at prisoners as part of the community, because they will be part of the community,” Bertsch said.